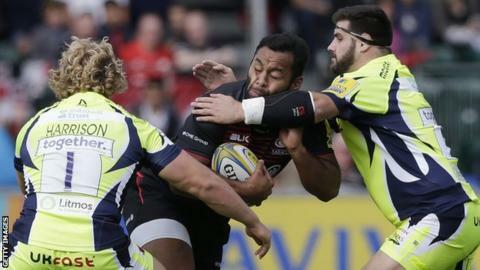 England's Billy Vunipola left the field with a knee injury as Saracens kept up their unbeaten home record over Sale with a bonus-point win at Allianz Park. The hosts led 17-3 at the break, with Ben Spencer and Liam Williams scoring for the European champions. Spencer scored his second after half-time, before Vincent Koch secured the bonus point on 64 minutes. Byron McGuigan crossed twice in the final quarter for the visitors, but they could not salvage anything. Vunipola's leg injury occurred in the first half and will be a concern for both club and country. The number eight was named in Eddie Jones' training squad for a camp in Oxford and, with autumn internationals against Argentina, Australia and Samoa on the horizon, the outcome of a scan on his knee will be eagerly awaited. Even without Vunipola - who missed the summer's Lions tour to heal a shoulder problem - for half the match, Saracens looked far superior to their opponents in their first home Premiership match of the season. Spencer, starting in the place of Richard Wigglesworth, looked sharp and sniped their first try through the middle of the ruck before putting in Wales outside back Williams to score on his home debut. With Brad Barritt rested for the game, Farrell took on the captaincy and produced a faultless display from the tee. Sale battled hard in the second half but conceded the bonus point before the final quarter, and while McGuigan added two scores - the second coming when he collected a deft chip from Ben Curry - they had a tough day at the office. Saracens director of rugby Mark McCall says Vunipola, who has 34 England caps, will have a scan on his knee to establish the extent of the injury. "It didn't look great and I hope it's not as bad as it looked, but he's gone for a scan," he said. "It's the same knee he injured for England against Argentina last November and it's cruel luck as we obviously feel for him terribly." McCall also confirmed that fellow back-row forwards Michael Rhodes and Schalk Burger will be out for 12 and four weeks respectively with their shoulder injuries. "We have some good academy players, who can fill in but it is likely that we will have to bring someone in," he added. "They had a really fast start and we felt as though we were hanging on in that first half. "We scrambled well in the second half and showed some decent parts of our game but we are pretty disappointed not to get something out of it as we threw away a couple of really good chances." "We practised yesterday with Faf at 10 as he's played there back at home so we are not offering any excuses on that basis." Saracens: Goode; Maitland, Bosch, Taylor, Williams; Farrell (capt), Spencer; Vunipola, George, Figallo, Isiekwe, Kruis, Itoje, Wray, Vunipola. Replacements: Brits, Thompson-Stringer, Koch, Day, Clark, Taylor, Lozowski, Earle. Sale: Haley, Solomona, James, Jennings, Charnley, de Klerk, Cliff, Harrison, Webber, Tarus, Evans, Beaumont, Ross, Curry, Strauss. Replacements: Neild, Flynn, Aulika, Ostrikov, Curry, Ioane, L James, McGuigan.